Big Basketweave is an appealing pattern. On vases, the exterior is an embossed crosshatched design that runs from head to toe. They are popular with collectors not only because they can be striking in appearance but also because they come in an array of styles, shapes, sizes, and colors. The vase pattern is virtually the same as the Crosshatched Basketweave secondary. The latter is found on the underside of most Persian Garden bowls and plates and on the exterior of all fruit bowl bases. Big Basketweave and Crosshatched Basketweave are known to have been made by both Dugan and Diamond. We know because colors associated with one era of production or the other are available in vases, bowls, plates, and two-piece fruit bowls. Swung vases are available in a variant in addition to the well-known conventional shape. Squatty vases are known in a version with a widely flared top as well as the familiar inverted cone (or ice cream cone) shape. 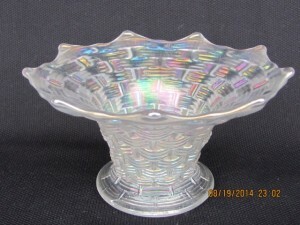 Fruit bowl bases are often turned upside down for use as vases, and handled baskets have long functioned as flower holders. 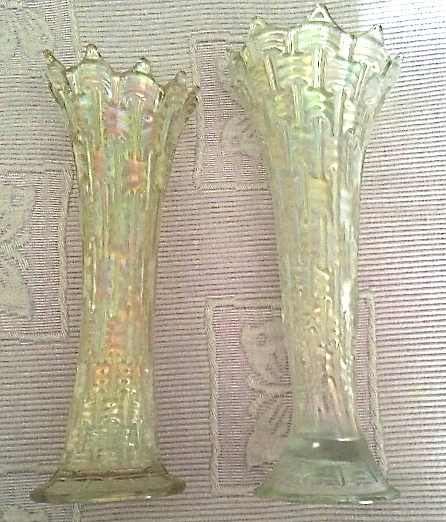 Most swung vases measure from nine to twelve inches tall, though a few are a bit shorter or an inch or two taller. Nearly all are typically shaped, with nine stubby flames that jut upward and slightly outward. There is no pattern on either surface of the base. A beautiful oxblood standard swung vase from Kevin and April Clark’s collection. This one, however, does not exhibit the traditional flames on top. The shorter a swung Big Basketweave vase, the more distinct and heavily raised the pattern is. The taller they are, the harder it is to recognize the crosshatching. 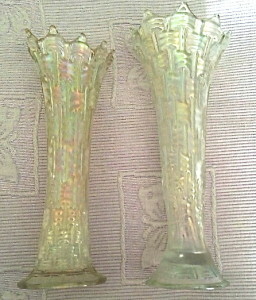 The base diameter of standard swung vases is three and one-fourth inches. The surface inside the rim of the base is flat. Swung vases are available in both vivid and pastel colors. Of the vivids, marigold is the easiest to track down. Amethyst are seen less often but “findable.” Oxblood and cobalt blue are even tougher to come by. Single examples have been reported in honey amber, horehound, and root beer. While the horehound and root beer have brought good money at auction, it is not clear if they actually are colors of their own or amethyst oddballs. The white are, by far, the most available of the pastels. They are seen nearly as often as, maybe more frequently than, the marigold. They are likely Dugan products as the frostiest white was made in the early years of the plant’s carnival production. Pastel lavender are also known, era of manufacture uncertain. A trio of pastel blues can be found: one with a finish that is both frosty and stretchy (celeste), a second is neither frosty nor stretchy (sapphire), a third is frosty but not stretchy (ice blue). The celeste is a medium sky blue, the sapphire an intense pastel, the ice blue variable in color (with lighter and darker shades known). Sapphire Big Basketweave vases are exceptions to the rule when it comes to iridescence: pastel without the marigold or butterscotch overlay that characterizes other Diamond carnival in this color (e.g. Beaded Baskets, Pulled Loop vases, and Double Stem Rose bowls, the latter pattern rarely seen in sapphire). Big Basketweave vases in the three pastel blue treatments appear to be available in about equal proportions. They are scarce but not unduly difficult to acquire. All are Diamond, made from as early as 1916 through at least the mid-twenties. 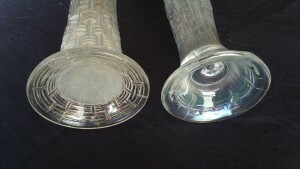 While the exterior patterns of standard and variant Big Basketweave vases are indistinguishable, they are different in two significant respects. First, their base diameters are different: three inches on the variant, three and one-fourth inches on the standard. Second, the base of the variant is deeply cupped inside the rim, flat inside the rim on the standard. Standard and variant swung vases in white owned by Kevin and April Clark. The photo above show the bases of the standard, and right, variant and the side view. The only variant I know of is a ten-inch tall frosty white. It belongs to Kevin and April Clark, from Delaware, Iowa, who specialize in vases. An eBay find, it’s unlikely anyone besides the eagle-eyed Clarks would have spotted the differences between it and the standard. It’s a shape I’ll be looking for. The squatty vases are seen less often than the swung. The range of colors of the squatty is more limited than the taller. 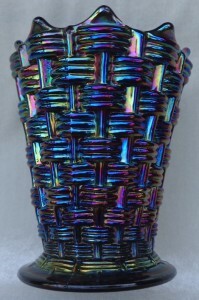 The typically-shaped Big Basketweave squatty vase is in all likelihood the shape from which other flamed vases were configured. These nine-flamed, non-ruffled round vases range from four and three-fourth to five and one-fourth inches tall. Their tops are a little over three and one-half inches in diameter. 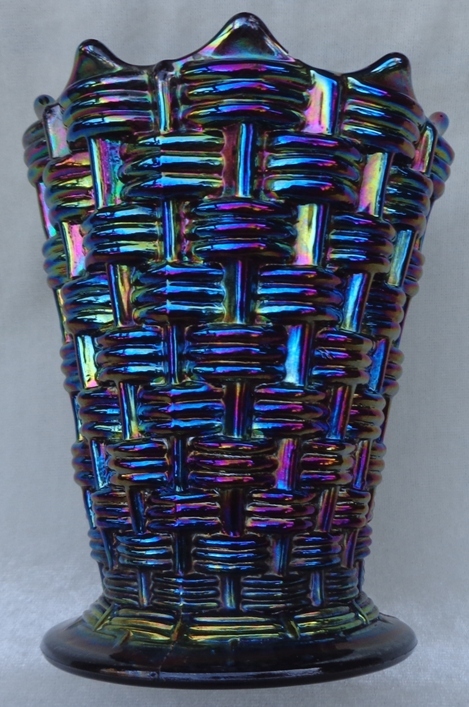 A spectacularly iridized typically-shaped squatty vase belonging to Kate and Bill Lavelle. Marigold and white are the easiest colors to track down. Amethyst or purple and especially oxblood are more difficult, although not extraordinarily tough to come by. Cobalt blue are really hard to find. While some say peach opal exist, I have doubts. I suspect their existence is a myth, apocryphally passed from one generation of collectors to the next. Flared and Flamed Non-Ruffled Round Squatty. The widely flared squatty is noteworthy because its mouth is way, way wide open, as if yawning. These vases are seen so infrequently that even veteran collectors have been surprised to learn they exist. They are in all likelihood a line-item derivative: a not unfamiliar shape made in extremely limited quantities. A white widely-flared vase that Tom Burns sold last fall at the Mid-Atlantic jamboree. The widely flared measure around six and one-half inches across the top, nearly double the three and one-half inch diameter of the typical squatty. They stand three and one-half to three and three-fourth inches tall compared to the five-inch tall non-flared. The three widely flared with which I am aware—the one illustrated here, another that Joan Doty has seen, and one posted at Pinterest—are a frosty white. All have soft yet sparkling rainbow iridescence inside and out. The one pictured changed hands in October 2014 at the Mid-Atlantic jamboree in Hagerstown, Maryland. 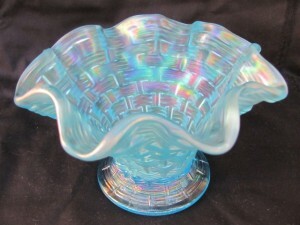 Not to be confused with the flamed squatty, the “base as vase” is the fruit bowl standard turned on its head. As far as I know, all bases are eight-ruffled rather than nine-flamed. The expanse across the ruffles measures five and one-half inches, give or take a quarter of an inch one way or the other. Most are four to four and one-fourth inches tall. They are available in a narrower range of colors than the swung but in a wider range than the squatty. Marigold and white are the most available. Amethyst and oxblood are seen less often. Cobalt blue are difficult to find. A dark ice blue is also known. Found decades ago not far from where it was made, it had been in a west-central Pennsylvania, collection before being sold by the Burns Auction Service at the Tampa Bay convention auction in 2014. The first to be reported, it brought $1050. If the buyer can find a matching fruit bowl, he or she will own one of the great rarities in Dugan-Diamond carnival. Tom Burns sold this first-reported ice blue “hat” at the 2014 Tampa Bay convention auction. Until the late 1960s, Tom Burns notes, bases were called “hats.” Tom recalls it was Max Gregory, an old-time upstate New York collector, who discovered the hat, turned upside down, would support the fruit bowl, that after pairing a Persian Garden ruffled bowl and a Big Basketweave hat he had purchased from Canadian collectors. Because there are many more bases available than fruit bowls, I’d bet the bases were produced to serve a dual purpose: as hat or vase and as base. It seems implausible to me that large numbers of bowls would have been broken or separated from bases to account for all the stray standards still out there. Big Basketweave baskets come in two sizes. If not made just as novelty items, they may have been designed to hold flowers, candy, or other commodities. The larger of the two baskets is, with handle, six and three-fourth inches tall. The height of the holder, without handle, is three and three-fourth inches. The banana-shaped body is five and one-fourth inches long and three inches wide. The handle was separately attached, it and the holder joined while the handle was still malleable. The congealing sometimes led to heat checks or other damage to handle or holder. 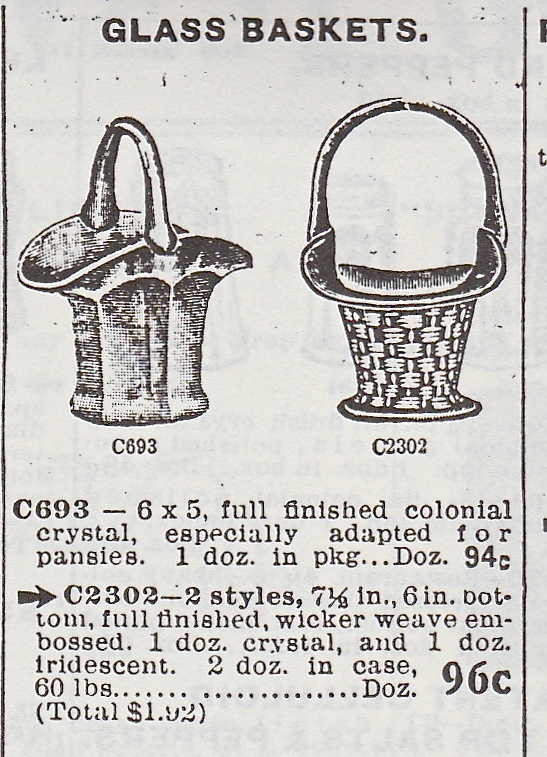 This Butler Brothers Catalog ad, 1916, shows the Big Basketweave basket beside a non-iridized Colonial basket. Nearly all the baskets are marigold, their handles a clear crystal. There is also a light lavender with matching handle. This color is like that of lavender Caroline baskets and bowls. Amethyst are said to exist, though I have searched in vain for one for years. I suspect the reported amethyst Big Basketweave are misidentified Beaded Baskets. It’s likely the body of Big Basketweave baskets was crafted from the same mold as the Persian Garden fruit bowl base. Their base diameters are identical, and the crosshatched design appears to be the same. Made from a different mold than the large, the smaller basket, with handle, is six inches tall. The holder, without handle, is two and three-eighth inches tall. The banana-shaped bowl is three and one-half inches long, two inches wide. Its base, with a star pressed into its underside, is two inches in diameter. The rope-like handle was part of the mold rather than separately attached. 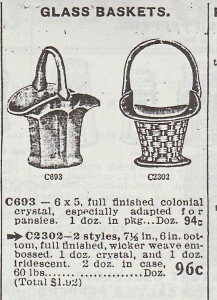 It seems like it would have been difficult to produce handle and holder in one operation but apparently it was not, as this basket is available in abundance. Marigold is the only color that has been reported in carnival. Surface color ranges from weak to robust. Light or dark, they hardly ever display much in the way of other iridescent colors. I am grateful to Kevin and April Clark, Kate and Bill Lavelle, and Tom Burns for affording me the opportunity to showcase glass they own or have sold and for graciously responding to repeated requests for detail and clarification. I also extend thanks to Neal Becker, Joan Doty, Aaron Hurst, and Gerald Thomas for leads and info.